September is Reye’s Syndrome Awareness Month! Just in time for school, September of each year is designated as Reye’s Syndrome Awareness Month! Just in time for Reye’s Syndrome Awareness Month, the National Reye’s Syndrome Foundation is offering some great tee’s in 3 fabulous colors to help spread the word that Kids and Aspirin Products Don’t Mix! 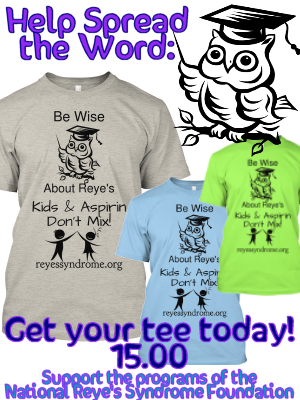 We hope you care enough about eradicating this child-killing disease to support our programs and help us get the word out by purchasing and wearing a “Be Wise About Reye’s” tee-shirt. Tees can be ordered until August 20, 2013 so they can be shipped to you before September. Join us in eliminating the incidence of this child-killing disease! Order Your Tee Today!! It’s tax-deductible, too! Comments Off on September is Reye’s Syndrome Awareness Month! eBooks and Apps – Oh My! RS Awareness CARE Packages Are Here!